Personalized bridal shower gifts make a statement. Whether they are engraved with names, monogrammed with initials, etched with the date, or hand painted with a cherished design, they just seem to be extra special. If you've ever received one, you probably still have it. Personalized gifts can be found in all price ranges. some of your choices. Take a look at the ideas below. Whether you are looking just for her, or searching for a unique couples gift, you just might find the perfect present. • A personalized ornament will become a cherished keepsake for years to come. 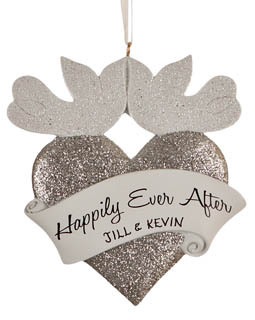 Choose a wedding, honeymoon, or first home item, then add names and date. 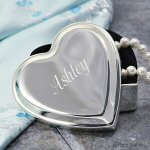 • Shop Beautiful, Hand Personalized Wedding, Anniversary And Engagement Ornaments at OrnamentShop.com! • An elegant picture frame is one of the best personalized bridal shower gifts to give or receive. What better way to celebrate the happy couple? • Add a personal touch to this vase with your choice of removable photo. This will be used year round. • Even couples who have planned out every detail of their honeymoon, might not think about luggage tags. These can be based on the type of honeymoon they are taking. • These handcrafted unity candles commemorating the wedding day, will become family heirlooms. • Toasting glasses help celebrate for years to come. They may also want to use these on their wedding day. Do they already have most of the basics? • A vintage bar sign is a great family room idea. Choose a design that suits their tastes. • Coasters come in a variety of unique designs. Some of the best ideas are thoughtful, yet practical. Jewelry is always well received. Add an initial or first name. • A charm bracelet is a personalized bridal shower gift that has universal appeal. • A monogrammed beach tote will be great for her honeymoon, or just around town. This classic design will be used often. • A soft luxurious robe will help her make a statement at home, at the spa, or at the beach. • A personalized beer stein is a stylish choice with an "old country" feel. • This engraved sports watch with belt clip and key ring is both stylish and practical, making this a popular choice. • Silver initial cuff links are a true classic for his wedding day, or any future special occasion. • A monogrammed grooming kit will keep him organized at home, or on the road. *** Whatever gift you decide to choose, know that your thoughts and planning will be appreciated. • Need more gift ideas? This monogram heart bracelet would make a lovely gift for the bride or her bridesmaids.